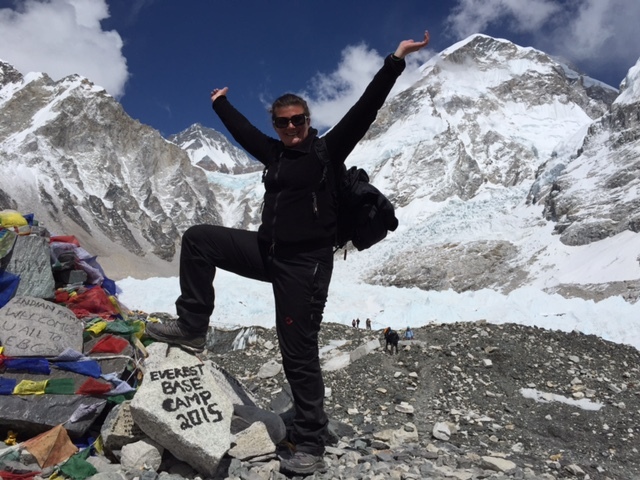 On 23 of April Angeline Davies and the group she was with reached the Everest Base Camp and celebrated their achievement. The Base Camp is at 5,364 meters; getting that far is not a walk in the park. The next day they started their descent. In my post from 21st September, Angeline describes how they were caught by the earthquake on 25th April. How quickly did aid come and who came to help? When you are in such a remote place, where there are no cars or trains, hardly any means of communication, no one is going to come to help you. As I said, we didn’t realise how bad the quake had affected Nepal and the area. We had no idea that thousands had died in Kathmandu, no idea that we had missed the avalanche at Base Camp by one day. We just kept walking. The weather was horrible: frozen rain, mixed with snow, low-lying fog….it wasn’t until we caught up with our porters, usually miles in front of us, and discovered that they had heard that Khumjung was destroyed, so they weren’t sure whether to keep heading there. That was the first time (and actually the only time) that I completely lost it. I was looking forward to seeing my friend, and here I was being told that the village he was waiting for us in was flattened. I started to run, and cry, but the altitude doesn’t let you run for long, and my hiccoughs turned into panicked hyperventilation. Incredible that I had been carrying around a comprehensive first aid kit full of all sorts of wonderful drugs, that I had been sharing (people pick up all sorts of minor ailments in the Khumbu valley, so it is good to be prepared) and I forgot that I was carrying tranquilizers for myself! Thank goodness the reports about Khumjung were totally wrong. The guest house was warm, welcoming, my friend was there waiting, and there was even internet so we could let our family know we were safe. Via Facebook mainly, we found out a lot of information. The UN, the UK Foreign Office told us to stay put if we were in a safe place. There were no cliffs or big rocks above us, threatening to come down on our heads in the next aftershock, there was food and water. We were safe. However, the next day most of our group wanted to keep going towards Lukla, against all advice. There was no way of knowing if the trail was safe, the weather was still bad, and anyway there were no flights out of Lukla, which indeed filled up with misguided hikers, trying to get out as quickly as possible, and fighting over hotel rooms and bottles of water. There were no flights out of Kathmandu either, and since that huge city had the highest casualty rate, and damaged buildings ready to fall at any time, I was at a loss to see why everyone was trying to get there. But they all pushed on, taking the guides with them, leaving myself and my friend, two porters and another friend who had become too sick to continue travelling. Indeed, I was hugely concerned about this chap, who was getting weaker and weaker. But the next day, just after the huge aftershock, a helicopter landed in the village square, and took him away. So then we were two…. Ang Tsherring Sherpa, owner of the Hill Top View guest house in Khumjung, and all his family made us feel part of their family. I guess sharing in a disaster like that does bring people together. His house was severely damaged at one end, crumbling down the hill (it has since completely collapsed). Their family shrine was in a room at the worst part, and we helped dismantle the beautifully hand-painted shrine, carry boxes of prayers and offerings to safety. On a side note about who helped us: the Nepalese did. The UK government didn’t. I’m still rather angry about this. Why is it that a population who has just lost their house, their livestock, their living, and in many cases, their loved ones (our neighbour in Khumjung lost her husband at Base Camp; the lady who looked after me when I was ill died in the second earthquake that had its epicentre at Khumjung/Namche) selflessly helped us foreigners, fed us, made us tea, nursed us (I fell ill with the same debilitating flu as my friend), guided us, when they should have been looking after themselves and their loved ones. 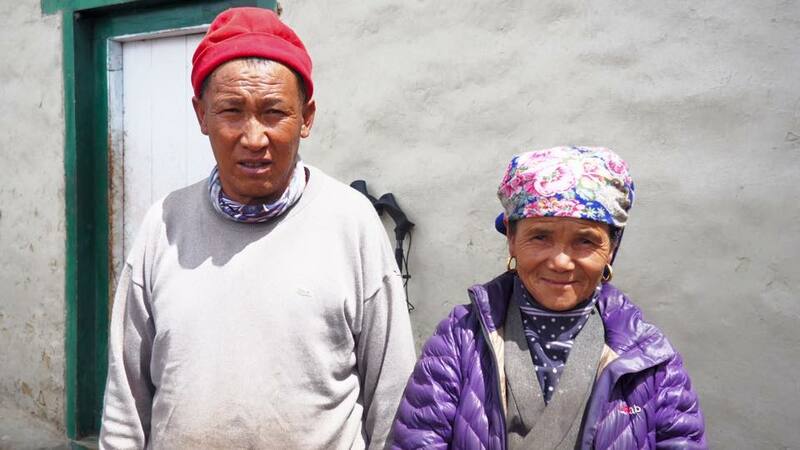 Our porters stayed with us, when they didn’t even know how their own families and houses were. What we lacked was information. (Incredibly our best source was via our friends back home, mainly through Facebook! We all had our iPhones, and the internet connection, though intermittent, saved us!) I was lucky and I was safe. I didn’t need rescuing, so I was not a priority, I understand that, however, I emailed, phoned, texted the UK embassy and Foreign Office, and to this day have not heard anything. 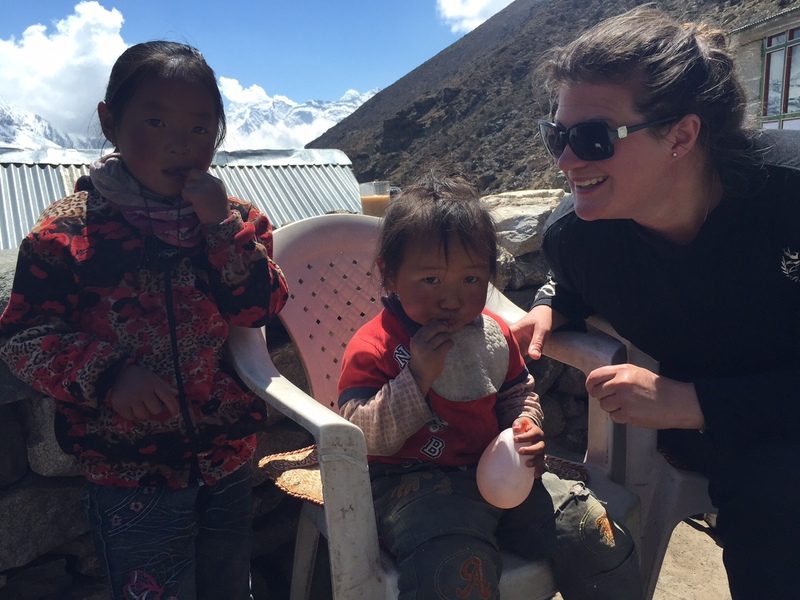 When we finally made it to Lukla, there were NZ and Australian government representatives, and Kathmandu airport had representatives from every country you can think of….except the UK! Rant over. How did you get to safety? Was there, in fact, any safe place to go? I guess nowhere was really safe. 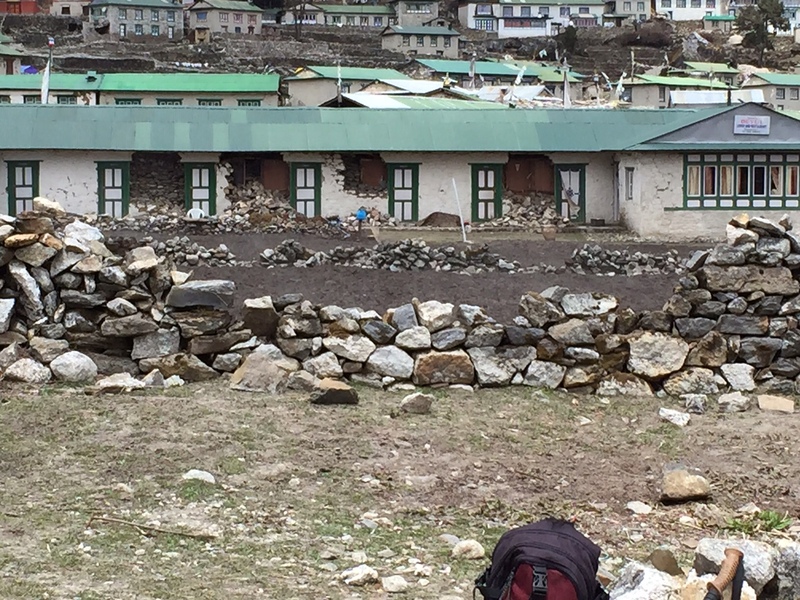 There was a prefab building at the guest house in Khumjung, constructed of just chipboard, so freezing cold, but not likely to do any damage if it collapsed. After a week we decided to carry on. We knew through the porters that the trail was now safer (though the accommodation in our first overnight stop in Phakding probably wouldn’t have stayed up if we had slammed a door). Both of us were still quite ill, so the hike back to Lukla was the toughest few days of the whole trip, tougher than making it to Khala Pathar (5,640 meters). But, despite walking through devastated villages, past shocked and terrified people, abandoned homes, some with livestock wandering in at the broken front door, the countryside was still absolutely beautiful, and the weather had improved. I guess so had our mood too, since we knew we were closer to getting home. This is a sort of guilt I bear. We could go home, leave all the suffering behind. The Nepalese were stuck there. And the aftershocks just kept coming. Even now more than 4 months later. Another memory which sticks in my mind was seeing a man trying to mend a roof, and dropping the sheet of corrugated iron from the ladder. On hearing this, his wife thought it was another aftershock and ran screaming out of her shelter with her children in her arms. When we arrived at Lukla, we met up with one of our guides, whose brother worked at the airport. After only half a day of hanging around the airport, they managed to get us onto a flight. The flight to Lukla from Kathmandu is supposed to be the scariest in the world, but, I must say, I really enjoyed it. We lucked out in Kathmandu. The hotel (where we had left bags that we didn’t need on the hike) was too dangerous, so we stayed in the glorious guest house belonging to the expedition organiser. We ate with the family – again, such kindness! How soon were you able to get word to your family that you were safe? Luckily when we got to Khumjung, I could send a text to my parents. It would only let me send 3 words (I am OK), but that was enough! Unfortunately after the aftershock of the next day, the communications were knocked out, so my parents were more worried that time. I guess the media in the West covered it very extensively. My friend at home heard from my parents that I was all right, and posted this on Facebook. So with the words I am OK and just one post on Facebook, everyone knew I was fine! How far did you make it up Mt. Everest? After this experience would you go there again? If I could afford it, I would go back tomorrow, but instead, I am raising money from here for those who helped us and for the hospital in Khunde. I got to base camp and up Khala Pathar (5640m), which were my goals. 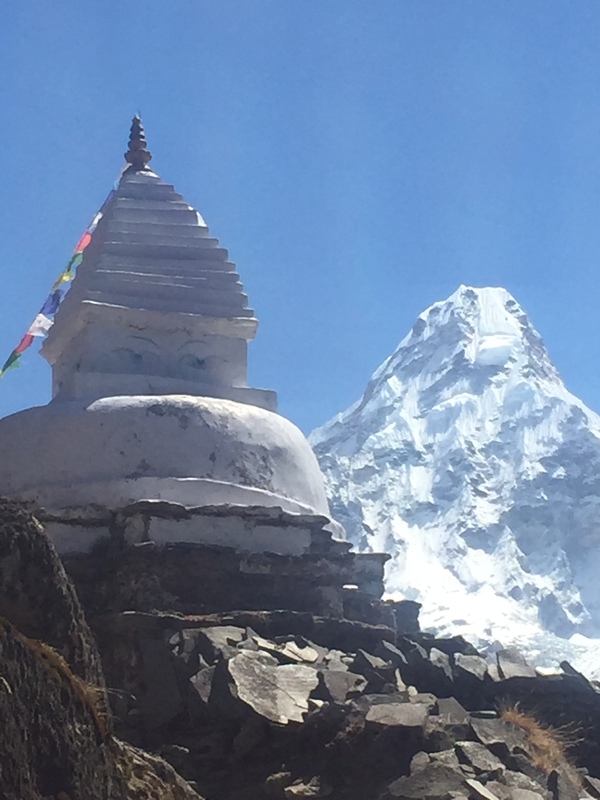 The locals say that Sagamatha (Everest) is angry and doesn’t want to be climbed. It certainly seems that way at the moment. In my heart I know that I wouldn’t reach the summit, though I would love to try. Yes I would go back. The scenery was some of the most stunning in the world (and I live in Switzerland, so very similar! ), but the people were amazing. I want to go back to see the friends I made, bring toys to the children, and most of all bring business to the people. Donating money is great, but these people want to work. The earthquake has been no great advert for Nepalese tourism, and now the monsoons are over, and the new climbing season starts, they are desperate for tourism to pick up again. Why have you started your own fund to help in Nepal? What will the donations be used for specifically? I am setting up this fund specifically to help the people and families who helped me during the earthquakes. Many of them are living outside in cold and wet weather, with difficult access to food supplies. The money I raise will go directly to these families to help them rebuild, pay porters to bring supplies and food over the ruined paths. and to help their neighbours, too, in rebuilding their communities. I would also like to donate to the Himalayan Trust to rebuild Khunde hospital since now Khumjung and Khunde have no medical care. 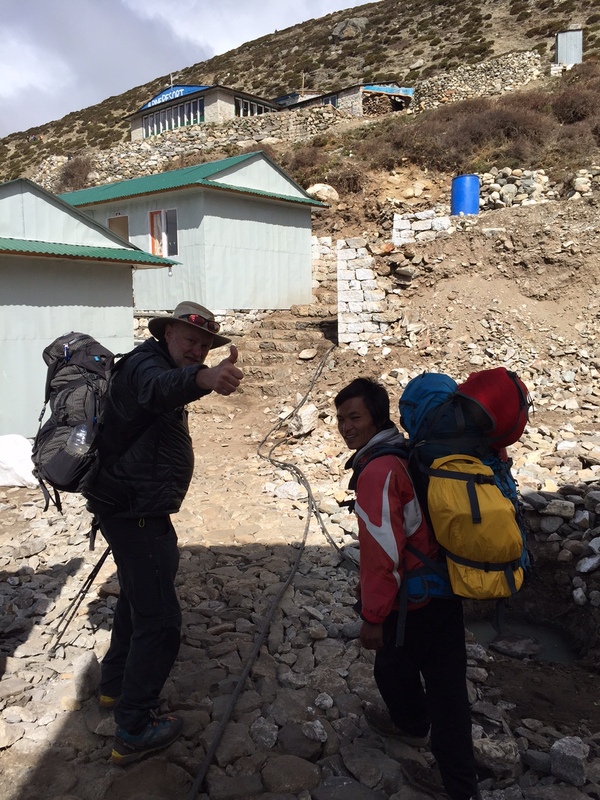 Sherpa Ang Tshering and family looked after me for nearly a week after the first earthquake. Since the second earthquake, the house that had deep cracks when I left is now too unsafe to enter. His mother-in-law passed away, and their only cow was injured by falling bricks. The path to Khumjung is partly destroyed and dangerous, and he writes me that the porters refuse to journey there, leaving them without food supplies. Homraj our porter lives in Phakding with his wife, his livewire of a son, 3-year- old Lucky Suman, and a large extended family. His house is a tiny wooden structure with cracks you can see through, insulated by newspaper. Suman is an 18-year-old porter, married with a 7-month-old daughter. Since the earthquake, the tourists are no longer coming, so there is no work. One of our guides Bibek, and our porters Bivek, Bigas, Bishal, Amik and Mon Ku Mari are all suffering from lack of shelter, food and no possibility of work. Angeline: Who are they? and who is he? 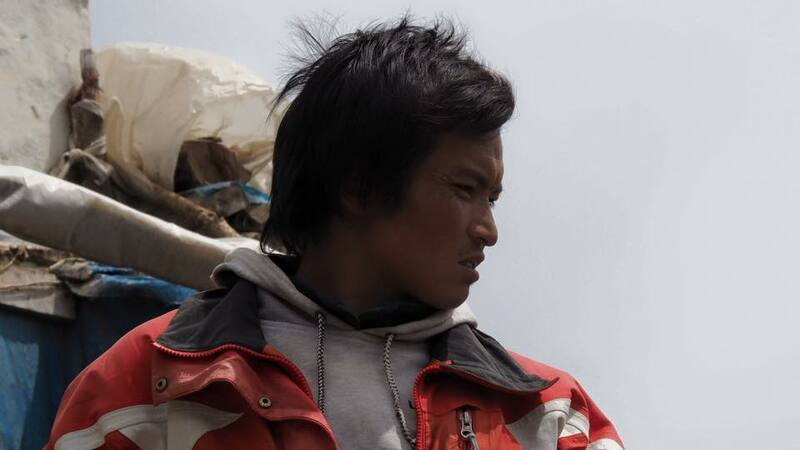 Mahendra Simkhada, our guide has family in the Ghorka region that was hit hard too. His home in Kathmandu is unsafe to enter, but he has been helping to coordinate the aid effort and bringing aid himself to his village in Ghorka. Rajan Simkhada, owner of Earthbound Expeditions, is based in Kathmandu and has set up his own charity that has already brought shelter, food and relief to many remote villages, with the hope of constructing earthquake resistant housing in the future. There are many stories like these. I decided to concentrate on a disaster I can relate to with my own experience, having lived through it, and being able to feel on a personal level the pain the people are going through. The lady who looked after me in her own, crumbling home, when I was sick, died in the second earthquake; the hospital where I was treated collapsed totally later…..these are real, personal experiences, and if I can’t solve the entire world’s problems, I can at least focus on one, and maybe make a small difference. Thank you, Angeline, for sharing your harrowing experience with us. To my readers, we’d appreciate support for the Nepalese. You can be sure that all donations to Angeline’s fund will go straight to them. 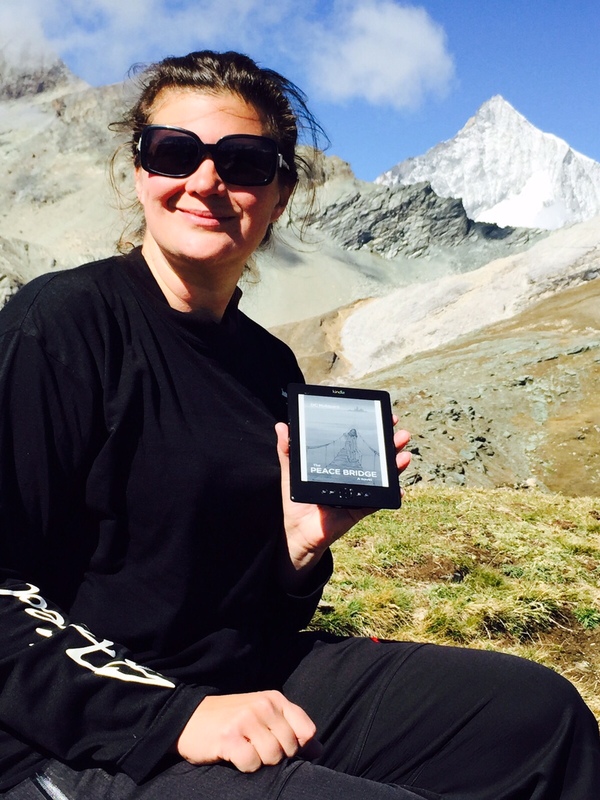 As an addendum to Angeline’s story, she had an ebook reader with her on her ascent. I was touched to hear that during this extremely stressful time, she read my novel, The Peace Bridge. She told me how much she enjoyed it. It helped distract her from the danger and uncertainty of waiting to get a flight out of Kathmandu. So The Peace Bridge made it to the heights of the Mount Everest Base Camp, survived an earthquake with Angeline and made it back home safely.